The Next French Revolution – Is it Beginning? This has followed what was billed as a violent protest two weeks before of nationwide against fuel taxes and living costs. Politicians simply never learn. This is not just the youth. This is the older generations as well. Revolutions come become of taxes and corruption. 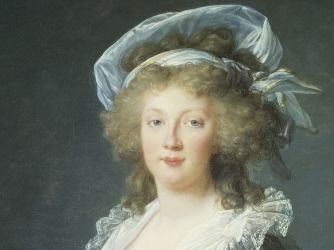 The famous saying of Marie Antoinette “Let them eat cake” was the popular slogan during the French Revolution. There is no evidence that she ever actually said those words. Still, it inspired a revolution. The “cake” was not a desert, but it was a term that referred to the crust of the pâté which was left over. It certainly seems that the EU politicians are making the very same mistake. With that callous remark that was attributed to Marie Antoinette, the Queen of France became the most hated symbol of the decadent monarchy. That simply fueled the revolution which would cause her to (literally) lose her head several years later. 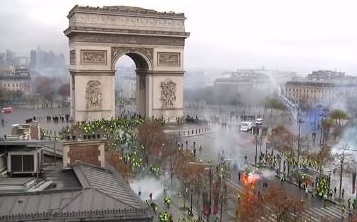 In Paris, the police fired stun grenades, tear gas and water cannon at protesters on the tourist street known as the Champs-Elysees boulevard. The police said they had arrested almost 300 people while 110 were injured, including 20 members of the security forces. As a consequence, there are now parts of the city of Paris completely void of police as there was a shortage to defend the entire city. This has resulted in groups of masked men roaming and looting through its fanciest shopping districts, smashing the windows of designer boutiques. We can easily be witnessing the start of the next French Revolution. Our model for civil unrest interesting turned up in France on February 18th, 2013. The year before on May 6th, 2012, François Hollande was elected as the new president of France. While he may go down as perhaps the worst president in French history, on May 5th, 2013 is when the protests in Paris began. That first protest numbered in the tens of thousands marking the rising discontent with the Socialist François Hollande after just one year in power. Even the many supporters of leftist parties expressed dissatisfaction over his handling of the economy. Ever since the civil unrest began on May 5th, 2013, there has been escalating economic tension within France. The lack of economic growth has plagued France and Europe as a whole. The French share market peaked in 2000 and has been unable to elect ANY Yearly Bullish Reversals to date and 2018 appears to be no different for this year’s closing. With the insane taxes of Hollande, the rich French invested outside the country and without private investment, there is no job creation of any worthwhile level. This is what the Socialists refuse to consider. Macron held a news conference in Buenos Aires where he said that there was no cause justified the looting of stores, attacking the security forces, or torching of property. Macron totally fails to comprehend that the violence is building frustration that historically is necessary to mature into a revolution. This is not a political movement. This is economically driven. The police said that violent far-right and far-left groups had infiltrated the yellow vests movement in a desperate effort to call them extremists. These protests began as a backlash against Macron’s fuel tax hikes, but have tapped into a growing resentment that all people get are higher taxes and lower standards of living. Macron may call them “thugs” but the “Yellow Vests” have widespread public support, even in cities. The vast majority of French people were fed up with Macron. You can see the anger is escalating more and more throughout France, according to my sources there, and Macron is as unyielding as was Hollande. Some say that Macron had written a book called Revolution. He obviously failed to understand what really makes a revolution – TAXES.